The latest item we have catalogued contributes to our already significant collection relating to Greenham Common Women’s Peace Camp. We were recently contacted by Michael Wood, the son of Mrs. Jocelyn Wood, who sadly recently passed away, to see if we would be interested in housing a piece of the Greenham Common fence and some photographs of the camp. Of course we said yes! An email from Michael is included below to introduce his mother’s text, which outlines her memories of being stationed at Greenham Common during the Second World War, years before she returned to Greenham as an activist. A big thankyou to Michael for letting us post this story on the website, along with the photos. If you want to view the items in the flesh, they bear the catalogue number DM2123/1/Archive Boxes 129. My wife has recently contacted you about a piece of fence from Greenham Common from my mother (Jocelyne Wood, nee Withycombe) – correspondence below. We think she has some photos as well which we will try to dig out and send them together. She did write a few notes about her life – nothing about going to Greenham during the seventies (?) but she was stationed there for a few months during the war until the Americans arrived – see attachment. We’ll be in touch again when we’ve found the photos. RAF Greenham Common was like a holiday camp after Hednesford, I spent three very enjoyable summer months there July to August 1943, WAAFs were billeted in a large house with a garden stretching down to the Kennet, a fast flowing chalk stream, It was ideal bathing, We were working outside doing daily inspections on Oxfords, which in good summer weather was pleasant work. We did the same jobs as the RAF – for which as far as I can remember we got half the pay, NCOs were all RAF and most had served RAF apprenticeships. Greenham was a Training Command station. WAAF mechanics were never sent to active service stations – a fact you were not told when you joined up. Our Greenham was very different from the USAF cruise missile base, The main Basingstoke road, now diverted, ran through the camp. As far as I can remember there were no fences even round the runway. It trained for night flying so there must have been some way of stopping traffic when flying was in progress. Hitching to Fleet from Greenham was easy usually only taking about an hour, so I went home a lot – sometimes just for a half day. The Services’ canteens and hostels were very useful, There were hostels in most major towns which I made much use of on my hitching expeditions. London ones were particularly useful making theatre visits possible, A uniform opened many doors. Looking back it seems very unfair. Girls conscripted to factories like ROF Chorley worked much harder and for longer hours than we did, were away from home living inferior hostels with inferior food but had no such facilities, nor did the Land Army. For other entertainment there was Newbury and the Americans, There were several US bases nearby that invited us to dances, The main attraction was the food rather than the G.I.s most of whom were boring. There were WO exceptions, I got to know David McGeon because I happened to tell him I was reading War & Peace. I went out with him several times. He was a film script writer and was fairly left wing. He was interesting, but too introspective to be easy company, Then Stan Sobolewski took over. I met him at a dance at the Corn Exchange in Newbury from where we walked through the park by the river orchestrated by thunder and lightning – but no rain. I saw a lot him during the next two weeks. He was tall, dark and handsome and very attractive, but not political. He was of Polish origin and came from Detroit, Two weeks later the blow fell: the Americans were taking Greenham over and the RAF had to move. Stan and I corresponded for several months and met once in London, but the magic had gone. I had had a lucky escape. The news of the move was devastating to everyone. We all liked Greenham. We had one week’s notice. A special train was provided for the move. The whole station packed up and moved. Our destination was Long Newnton, Glos. It was an unattractive camp and the nearest town, Tetbury, was no compensation for Newbury in spite of its lovely old buildings. I was there less than a week before I was posted yet again – to the Fitters’ Course at Halton. This entry was posted in Archive and tagged Arts and Culture, Cataloguing, Greenham Common, New Additions on November 27, 2013 by feministarchivesouth. Their answer to this problem was to create a tape-slide and audio presentation that would be used in groups and on Radio Bristol’s ‘Access’ programme. They took photos of the Bristol Women’s Liberation activities and asked women the following question: ‘What difference has the Women’s Liberation Movement made to you in your daily life, in your relationships, your day-to-day routine, & your feelings about yourself as a woman, as well as your political awareness and activism? One of the women they interviewed was Monica Sjöö, who died in 2005. In the extract below she talks about being a woman artist and the difference that women’s liberation makes. This entry was posted in Archive and tagged Arts and Culture, Creativity, Digitisation, Public History, Women's History on April 30, 2013 by feministarchivesouth. This entry was posted in Publications, Workshops and tagged Access, Arts and Culture, Collections, Learning Resources, Public History, Women's History on April 29, 2013 by feministarchivesouth. This week we were visited by Conni Rosewarne who is filming parts of the archive for her third year university project. Conni was particularly interested in material relating to Greenham Common, as both her grandmother and mother protested at the camp. Greenham Common Women’s Peace Camp, established in Sept 1981, was a protest against the presence of nuclear cruise missiles on British land. Missiles were removed from the camp in 1991, but women still protested there until 2000. For more information about the camp, please visit here and here. This photo is a piece of the fence, which women used to cut into during actions. This photo is of a collectively made shawl by Greenham Women which depicts a number of spider webs sewn together. Before the world wide web connected people across the world, women at Greenham used the metaphor of a spiders web to imagine global connections between peace activists. Conni in action! She has promised to send us her film when it has been made – so watch this space! Another close-up of the fence – a highly emotive part of our collection. If you want to see some amazing pictures of Greenham, visit Cary Welling‘s site. This entry was posted in Archive and tagged Archive, Arts and Culture, Collections, Creativity, Greenham Common, Research on April 19, 2013 by feministarchivesouth. 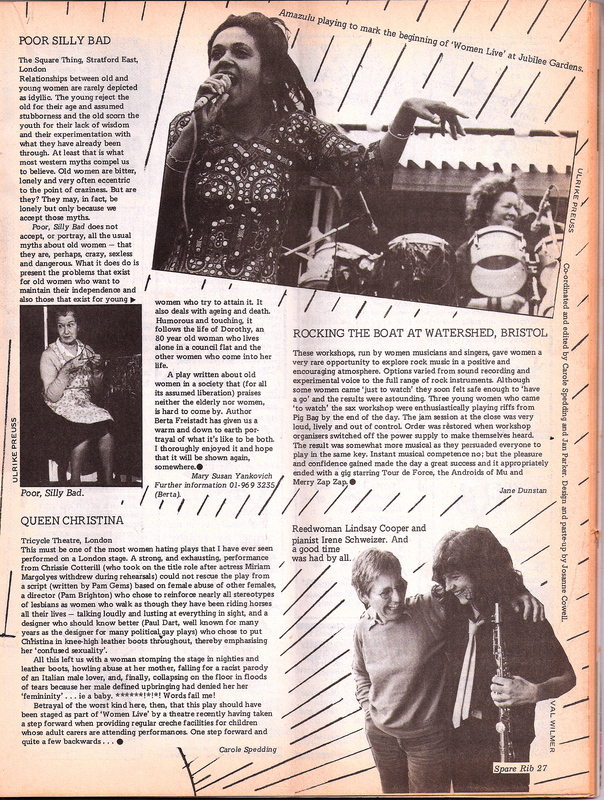 Women Live was a UK-wide women’s network which held festivals and networking events that showcased women’s talents across a range of arts including film, visual art, theatre and music in the early 1980s. There was also discussions about topics such as sexuality, work and media representation. Women Live were remarkably similar to Ladyfests, the punk feminist festival started in Olympia in the USA in 2000. Ladyfests similarly combine performance, discussion and empowerment initiatives, but also provide a template for organising feminist cultural events in different geographical locations. Women Live events happened in Bristol, Edinburgh, Tyneside and London – although may have happened in other places too. If you know of any cities that held Women Live events, or have any archive material relating to such events, please get in touch so we can gain a more accurate picture of when and where Women Live took place, and who performed at them. 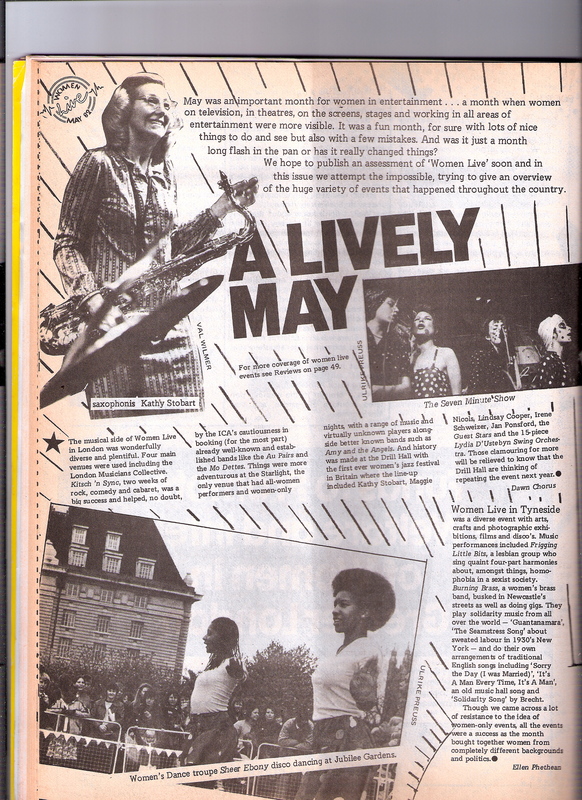 There is an extensive archive of Women Live Edinburgh (1981-1985) in The Glasgow Women’s Library which includes posters, leaflets, programmes, badges and newspaper cuttings regarding each of the festivals and other events. There is also correspondence relating to sponsorship, membership etc, several drafts and copies of the constitution, minutes of meetings, agendas and newsletters, photographs of events and performers as well as biographies of certain performers and information from similar groups or movements. Women Live events in London had a strong musical programme, and performers such as The Guest Stars, Maggie Nicols, Irene Schweitzer, Julie Tippetts, Jans Ponsford Quintet, Jam Today and Amazulu played. There were also performances from dance troupe Sheer Ebony and theatre group Monstrous Regiment. This entry was posted in Archive and tagged Arts and Culture, Posters, Women's History on April 6, 2013 by feministarchivesouth.